Arrive at the airport and transfer to the hotel. Late on board your glass-topped boat for an exciting Amsterdam canal cruise. Amsterdam Night Tour - Visit the famous Dam Square – the real heart of Amsterdam, where the Royal Palace, the NieuweKerk and the War Memorial overlooks this vast and bustling open space. Overnight in Amsterdam. Buffet Breakfast at the hotel. Proceed to Visit ZaanseSchans Cheese & Clog Factory. After Lunch proceed to Keukenhof Tulip Gardens– the largest spring garden in the world. Bulbs of colourful tulips bloom only till May 16th. Be enchanted by the indoor floral displays. Overnight in Amsterdam. Buffet Breakfast at the hotel. Check out & depart to Brussels. Visit Atomium Structure for photo stop. Walking Tour of Brussels. Visit the world renowned Grand Place and the legendary MannekinPis statue. Drive past St. Michaels Church. Depart for Paris. Enjoy a romantic Seine cruise as we sail past some of the historical monuments on the river Seine. Overnight in Paris. Buffet Breakfast at the hotel. Proceed to City tour of Paris, which includes the Alexander Bridge, Arc de Triomphe,Concorde Square, Opera Houseand much more.Visit to Eiffel Tower – Level 3, from where you will have a splendid view of this beautiful city also Visit to Champs Elysees. The Avenue des Champs-Elysées is probably the most famous avenue in the world. This impressive street stretches from the Place the la Concorde to the Place Charles de Gaulle, the site of the Arc de Triomphe. After dinner Paris by Night Tour. Admire Paris spectacular nighttime scenery and enjoy sightings of monuments including the Illumination of the Eiffel Tower. Overnight in Paris. Buffet Breakfast at the hotel. Join us for some fun, adventure and entertainment on our tour to Disney Park and enjoy the many rides OR you can visit the Disney Studios and be amazed by the stunning stunt shows, watch a film being made and see real-life sets where famous movies were created. Overnight in Paris. Buffet Breakfast at the hotel. Check out & depart to Geneva. Orientation tour of Geneva. View Flower Clock, UN Building, Jet d'Eau& many more sights. Overnight in Annemasse. Buffet Breakfast at the hotel. Proceed to Mt. Titlis. orientation tour of Lucerne. You will visit the Lion Monument and the KapellBrucke (wooden bridge). Here you will also have some free time to shop for famous Swiss watches, knives and chocolates. arrive Engelberg& adventure awaits you in an ALL NEW cable-car ride up to Mt. Titlis. Witness the worlds first revolving cable-car ride, a truly once-in-a Life time experience. Remain spellbound as you ascend the snow-clad mountains. Experience the snow and ice on top of Mt. Titlis. At 3,020 metres a breathtaking panorama unfolds. Do not forget to visit the new attraction "Cliff Walk". Overnight in Engelberg. Buffet Breakfast at the hotel . Enjoy adventurous ride to visit Jungfraujoch – The Top of Europe, for a memorable encounter with snow and ice – a genuine high-point of your tour. You will be amazed at the scenic splendour that you see from aboard the cogwheel train, which takes you to a height of 3,454 metres to reach Jungfraujoch. This is a trip to another world – a wonderful world of eternal ice and snow. Experience the magic of the mountains and visit the Ice Palace on top of the longest glacier in the Alps. A visit to the Sphinx is also included. Proceed to visit Interlaken, a charming city nestled between two lakes and surrounded by the splendid Bernese Oberland Mountains.Treasure these wonderful moments as you drive back to your hotel. Overnight in Engelberg. Buffet Breakfast at the hotel . Check out &proceed to Black Forest, surrounded by dark fir forests, fairy tale woods and flowering meadows. Here is the home of the world-famous cuckoo clock. Get invited for a free demonstration and buy one for your home – a prized possession. Visit Cuckoo Clock Factory.Visit Rhine Falls, The largest waterfalls in Europe. Depart for Zurich. Overnight in Zurich. Buffet Breakfast at the hotel . Check out & depart to Innsbruck. Orientation tour of Innsbruck, See the Golden Roof and the Maria TheresienStrasse. Stroll on cobblestone pathways and get a feel of old-world European charm. Proceed to Wattens, where you will visit the world-famous Swarovski Crystal Museum. Enjoy a mesmerizing experience in to the world of crystals. An experience that leaves you amazed at the dazzling glitter as you walk through this museum. Overnight in Innsbruck. Buffet Breakfast at the hotel . Check out & depart to Venice. Proceed to the pier and board your boat which will take you to the heart of the traditional city of Venice – The St. Marks Square. On arrival, admire The St. Marks square with the Basilica, Doges Palace, Campanile and Bridge of Sighs. Also visit the Murano Glass showroom. Overnight in Padua. Buffet Breakfast at the hotel .Check out & depart to Pisa. Visit to Leaning Tower of Pisa. Visit the Square of Miracles. Photograph your family with the Leaning Tower in the backdrop. You also have some free time to shop. Depart to Florence. City tour of Florence, including the Duomo, the Campanile, the Baptistry with its Gates to Paradise, Piazza Della Signoria – an open air museum of sculptures, the famous Ponte Vecchio bridge across the river Arno Drive to Piazzale Michelangelo, a square on top of a hill with its replica of the impressive statue of David and also get a birds eye view of the city of Florence. Overnight in Florence. Buffet Breakfast at the hotel .Check out & depart to Rome. Check into your hotel. Explore heart of Rome by walk around Trevi Fountain. Overnight in Rome. Buffet Breakfast at the hotel. City tour of Rome, which includes the Colosseum, a vast amphitheatre, known for its gladiator fights. 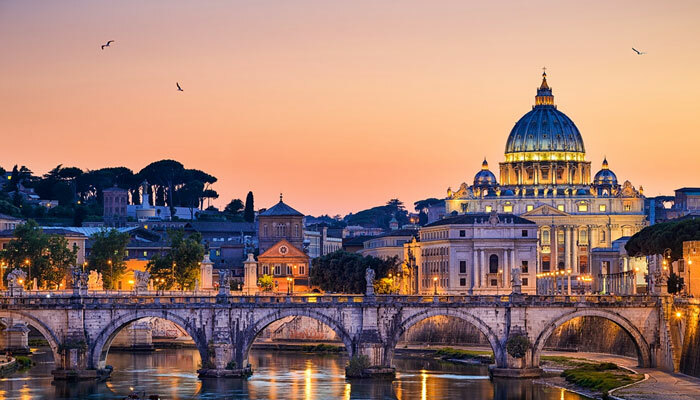 Visit the Vatican City &Also see the Victor Emmanuel Monument, the Roman Forum and many more sights of this historic city. After Dinner Proceed for Rome by Night Tour. There's nothing quite like Rome at night. On this illuminating tour, you'll be delighted as the sights of The Eternal City that amazed you by day simply astonish you by night. Enjoy a relaxing panoramic tour of the city, and discover the magic of Rome's most famous monuments lit up under a darkened sky. Overnight in Rome.